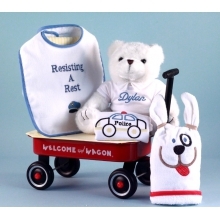 When it comes to welcoming a new baby to the world Welcome Wagon� baby gifts are classics. Year in and year out they rank among our best sellers. The reason why is that this gift better than most combines great components, fantastic good looks, and the perfect expression of welcome to the new baby. This particular gift for a baby boy starts with a premium quality, custom manfactured wagon made of wood. It's impeccably finished in red, and features our trademark Welcome Wagon� logo printed on both sides in contrasting white lettering. 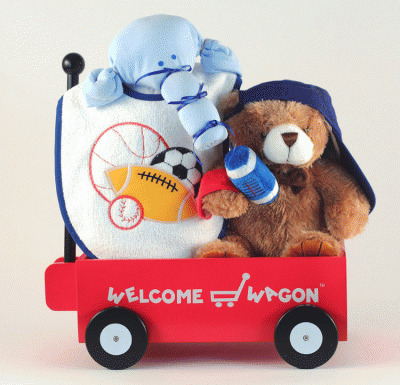 The wagon is a welcome addition in the nursery filled with baby's things, and will provide years of fun and enjoyment as a functional pull toy for when baby begins walking. The 15" x 9" wagon includes a 12" long wood pull handle and passes all required consumer product safety testing. 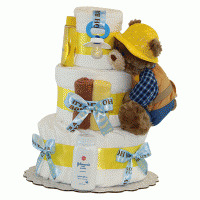 Inside this unique baby gift is a cotton terry bib, a 100% cotton interlock onsie cleverly presented as an elephant, a sports cap for the little slugger, a sports themed plush wrist rattle, and a soft & cuddly 10" plush bear. Please note to choose either a brown or white bear. 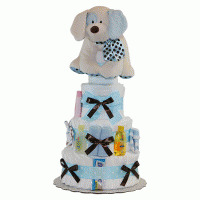 Welcome Wagon� Baby Gift comes beautifully wrapped in a crystal clear cello bag with coordinating ribbon and gift card message. 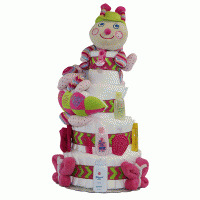 Also available in both personalized and deluxe version for boy and in both configuations for a baby girl.